Egypt's President Abdel Fattah al-Sisi yesterday met in Cairo with Khalifa Haftar, the commander of eastern-based Libyan forces, who is under international pressure to halt an advance on the capital Tripoli. Egypt has close ties with Mr Haftar, whose Libyan National Army (LNA) controls the east and swept through the mainly desert south earlier this year before moving to Tripoli 10 days ago in a major escalation of the conflict. His move is the latest in a cycle of conflict and anarchy since the 2011 toppling of dictator Muammar Gaddafi. 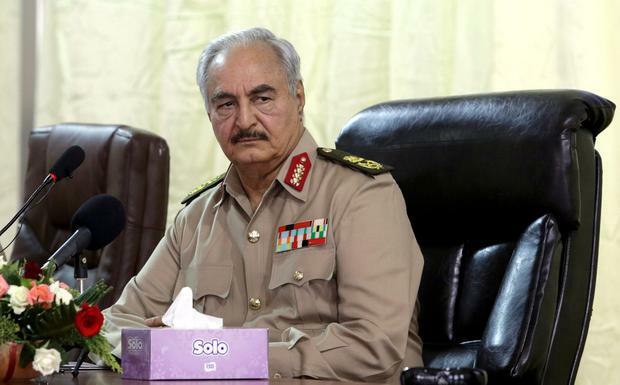 Mr Haftar has projected himself as the scourge of Islamist militants and of the militias that grew powerful after the uprising. His rivals say he has fuelled conflict and risks returning Libya to authoritarian rule. Egypt and the UAE publicly support UN-led peace efforts in Libya, while being seen as Mr Haftar's closest allies. Mr Sisi has led a far-reaching crackdown on Islamists in Egypt and has blamed Libya-based militants for some cross-border attacks. A statement from Mr Sisi's office "confirmed Egypt's support for efforts to combat terrorism and extremist groups and militias in order to achieve security and stability for the Libyan citizen". Mr Haftar, a former general in Gaddafi's army who later turned against him, had long talked of a move on Tripoli, in Libya's west, where an internationally recognised government sits. His campaign has disrupted efforts by the UN to bring rival eastern and western administrations to the negotiating table to end the turmoil. "Our position will not change," UN envoy Ghassan Salame tweeted. "No matter how obstinate one becomes, there is no solution except a political one."